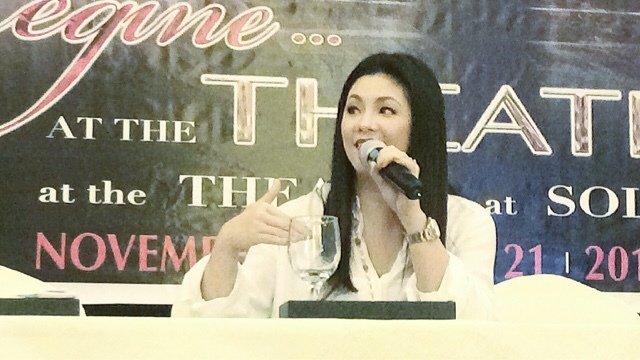 Asia's Songbird Regine Velasquez Alcasid in "REGINE... at the Theater"
Had the chance to attend the press conference of Regine Velasquez Alcasid earlier at the Luxent Hotel in Quezon City. 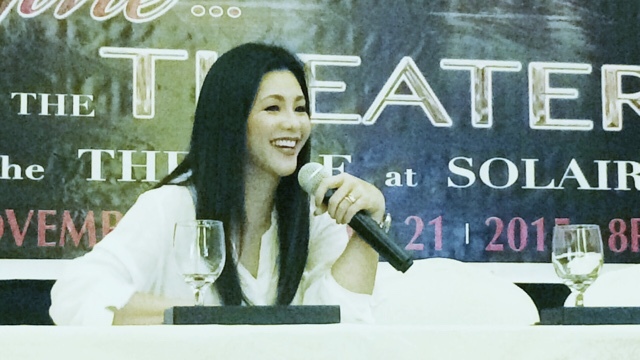 This time, Asia's Songbird is going to sing songs from theater. She's going to have a couple of songs from Broadway, from classic shows, from local hit theater productions and put them all into one place, the THEATER at Solaire Resort in Pasay City. The last time I heard her sing, she guested during the show of Glaiza De Castro in Music Museum. I couldn't believe she still sounds so perfect, powerful and unbelievably flawless during that evening. The lovely signature pitch, style is just about as lovely as the day we heard her sing, a thing that people would love to have more. She's bringing in a couple popular songs and also adding new ones as she feels her repertoire shouldn't just stick to the usual songs she sings in concerts in the past. She says that it'll be a different set of songs but people would still really love. It was hard to do this and put up the production costs, but finally, everything has just come into place. Regine admits to have had a phase where she had a hard time singing but now that her form is back, they're taking advantage of it and says people will have a good time when you watch the show. Ticket prices for SSVIP CENTER Php 6,360.00, SVIP CENTER Php 5,300.00, SVIP SIDES Php 5,300.00, VIP Php 4,240.00, PREMIUM CENTER Php 4,240.00, PREMIUM Php 4,240.00, PATRON CENTER Php 3,180.00, PATRON Php 2,650.00, BALCONY CENTER Php 2,120.00, BALCONY Php 2,120.00, REAR BALCONY Php 1,060.00, and REAR BALCONY CENTER Php 1,060.00. I think the excess is for tax, that's what they kinda thought on my table earlier. Jonalyn Viray and Aicelle Santos will be her guests in the show but they'll be doing different days. She knows how good they both are and she's looking forward to how you'll be enjoying the show in a great venue, with good acoustics, in pure unadulterated Regine Velasquez Alcasid form. It will happen on November 6, 7, 20, 21 at 8PM. Congratulations, this will definitely be successful!